With his best guy friends by his side, the groom struts down the pathway. The five men smile as they walk. Although all the guys wear the same light blue dress shirts, white corsages, dark blue pants, dress shoes by Prada, and brown belts, the groom stands out from his groomsmen with his dark blue Etro sportcoat and his fancy black and white bow tie. These boys sure have an eye for fashion! The sun casts light on the plants above them, but the stone walls keep the men in the shade. 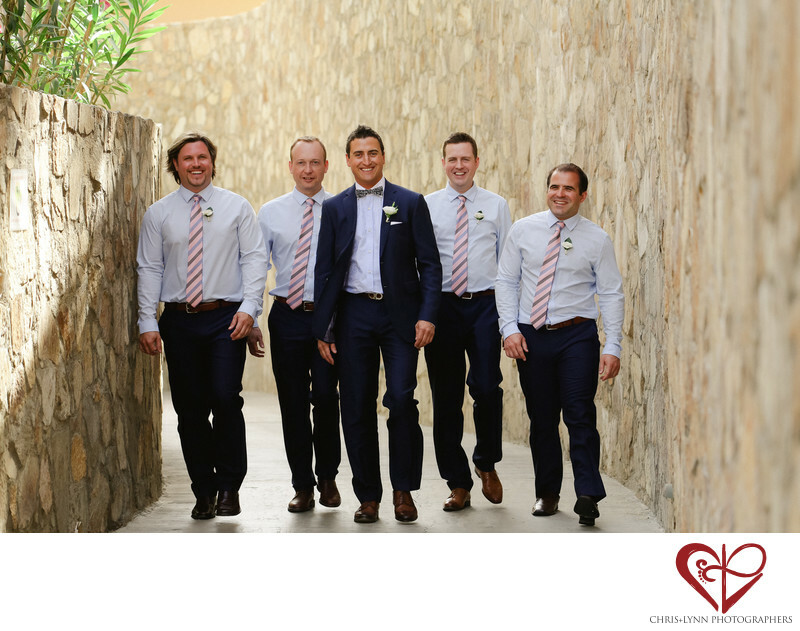 We love the groom’s confidence as he excitedly makes his way down the path to meet his bride. 1/400; f/4.5; ISO 400; 116.0 mm.